This recipe is very customizable, but I will outline the basic ingredients and method below. I find this a great way to use leftovers rather than always starting from scratch. This has become my favourite at home hot lunch. Pair it with a cup of soup or some raw vegetables if you're really hungry, but I find this lunch gets me through the afternoon, with steady blood sugar. If you want to make 2 wraps at a time, double the recipe and cook all the vegetables at once, and assemble and heat 1 at a time. My husband loves these too. Melt 1 tsp. coconut oil in large skillet (preferably cast iron or stainless steel). Saute onions until translucent. Add green vegetables to pan. If longer cooking like asparagus, add some water and put a lid on pan to steam until tender, stirring occasionally. When almost done remove lid to allow liquid to evaporate. Once cooked set aside onto plate and add remaining coconut oil to pan. 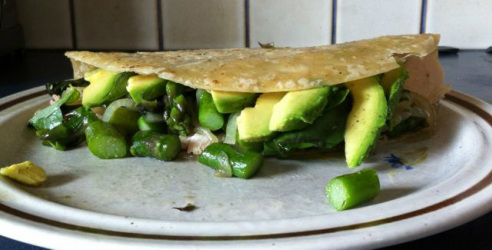 Lay in rice tortilla, and load one side with protein, veggies, avocado and seasonings. Leave in pan until warm and soft, taking care not to let oil get too hot (it will start to smoke, that's not good). Fold wrap over contents and slide to a plate. Enjoy! Liver – is source of preformed vitamin A, for immune and tissue health, vitamin D to assist calcium absorption and regulate bone mineralization, B vitamins for stress and metabolism. Just as our own livers are our bodies' powerhouse, eating liver is something that is avoided these days, to our detriment. If you are going to eat meat, you shouldn't focus only on muscle meats. The organ meats are extremely nutrient dense and in many traditional cultures, women of child bearing age were prepped with high nutrient density food to prepare them for pregnancy. 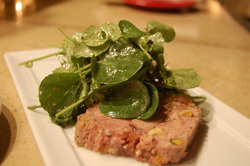 Foods like eggs, spring grass fed butter, organ meats, fermented foods etc. It's time to revive some old traditions. Concerns about cholesterol are being found to be overblown. In fact, our bodies need cholesterol to make hormones. Considering the current epidemic of hormone imbalance, this is a tasty way to work towards some balance. Melt oil (butter) in heavy skillet, then add livers onions and mushrooms. Cook stirring occasionally, for 10 minutes or until livers are browned and mushrooms are soft. Add cooking wine, garlic, mustard, lemon juice and herbs. Simmer until liquid is almost gone. Cool slightly. Process mixture in several batches until smooth. Salt to taste. Place in lined mold and chill. 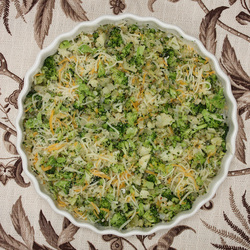 Serve with crackers, tortilla chips or raw veggies. This makes a simple dinner served with a salad and maybe a starchy vegetable like sweet potato or white potato or a hearty grain dish. Leftovers make a great quick, high-protein breakfast. Increase the recipe for more leftovers. Experiment with different vegetable mixes like asparagus and peppers, zucchini, mushrooms and sun-dried tomatoes. Eggs are a great source of hormone building cholesterol, vitamins A, D, E, and brain and nerve supporting EPA, DHA, choline and inositol. Broccoli is a cruciferous vegetable which is a good source of fibre, minerals, and hormone balancing indoles. Blanche broccoli - boil for 3 minutes then quick cool with ice water and drain. Sauté mushrooms and onions in coconut oil. Spread mushrooms and onions over bottom of greased (with coconut oil) 8x12 or 9x13 pan. Evenly distribute broccoli over mushrooms. Beat eggs and season then pour over vegetables. Sprinkle cheese over if using. Bake at 350°F for 25 -30 minutes until eggs are set.